You don’t need to remind Jameel McKay that the No. 32 has an almost-sacred aura surrounding it in the Marquette basketball community. Don’t bother telling him that two of Marquette’s all-time greats have worn the same jersey six of the last seven seasons, winning dozens of games and earning All-Big East and All-American accolades in the process. He doesn’t need a rundown of the increased expectations that come with two simple numbers, a “3” and a “2,” being stitched onto his Marquette jersey. Don’t waste your time. He already knows that all that. It’s the reason he chose to wear the number. Fate, too, may have played a small factor in McKay’s decision to choose the number. When assistants Brad Autry and Isaac Chew mass-texted the five-man recruiting class about choosing numbers, saying requests would be taken on a first-come, first-served basis, McKay’s cell phone lost power. While McKay sat in technological silence, incoming freshman Duane Wilson swiped up No. 1, McKay’s jersey number at Indian Hills Community College the last two seasons. A second freshman, Jajuan Johnson, nabbed the No. 5 jersey McKay wore at Pulaski High School in Milwaukee. John Dawson nabbed No. 2, the other jersey number McKay donned at Pulaski. Fellow Milwaukee native Deonte Burton chose No. 30, taking another choice off the board. When McKay ultimately found a charger and regained battery life he was the last to pick, leaving just a handful of options. No. 32 it was, following in the footsteps of power forwards Lazar Hayward and Jae Crowder, two of the most heralded players to ever don the blue and gold, who wore the number from 2006-2012. It’s just one small example of how McKay, a two-time junior college All-American, isn’t backing down from expectations the fans, media and coaches have for the 6-foot-9 switchable. At the top of every Indian Hills scouting report, opponents found McKay’s name. After averaging 14.6 points and 7.7 rebounds as a freshman, he was named to the junior college All-American team. A national secret his first season in Iowa, he wasn’t going to sneak up on teams in his second season. 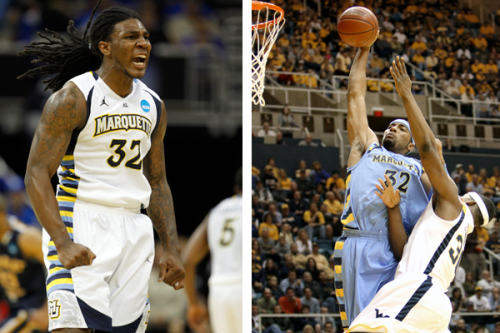 The last two Marquette players to don the No. 32 jersey accomplished quite a bit. No problem. One year later McKay had been named to his second All-American team—a first in team history—after averaging 18.7 points on 57 percent shooting and 11.8 rebounds, helping the Falcons to a 26-4 record. McKay, who was forced to play more center than he normally would have due to Indian Hills injuries, said a positive from being keyed in on by opponents every night was having to diversify his offensive game. Always a threat around the basket, McKay said he developed his 15-footer and even introduced a hook-shot to his arsenal. The new-found flexible attack taught him to look for the best shot, improving his field-goal percentage and overall game. One area he wasn’t able to show off that he should at Marquette was from beyond the arc. Playing center didn’t allow him much freedom on the perimeter, but he did note that he plans to be the trailer in Marquette’s offense, allowing him plenty of 3-point looks. He had a chance to work on his skills with Burton and Wilson during his spring break, which he spent in Milwaukee with his family. He ran 5-on-5 sessions with the pair of incoming freshmen and even met up with a few current players when they returned home from their Elite Eight loss to Syracuse. With forward Juan Anderson and leading scorer Vander Blue leaving, McKay knows his role will change. He said he wasn’t planning on “taking a backseat” in his junior year, but, just as he has done the last two seasons, he’s pouncing on the opportunity to produce and overachieve on expectations. He’s not blind to the scrutiny the past week has brought Marquette. Blue and Anderson are gone, along with Junior Cadougan and Trent Lockett, meaning four starters must be replaced. General expectations have been slightly tempered. But that’s not an issue to McKay. When he arrives on campus May 20 he’ll do so with the same attitude and focus he prepared for when he committed to Marquette 10 months ago. Yes, the newest No. 32 is already sounding a lot like the old ones. Another great article. PLEASE do not leave Paint Touches until we cut down the nets at the finals of the NCAA tourney. Jameel is going to be a very strong player for Marquette this year. He will fit in nicely with the rest of the big men and brings some needed shooting skills, more playing time is now available and he will make the most of it.